The logos and uniforms of the Dallas Cowboys have gone through a lot of changes over the years. At least, this is true for the uniform. The logo did not have the same colourful history as the uniforms. Let us start with the logo of the Dallas Cowboys. The logo is a simple blue star. This simple logo represents the state of Texas – which is considered as the “Lone Star State”. It is actually one of the most recognised logos in the NFL. At first, the logo was a solid star. In 1964, a white line and blue outer border were added to give more character to what is actually a very simple logo. Since then, nobody really thought about changing anything. 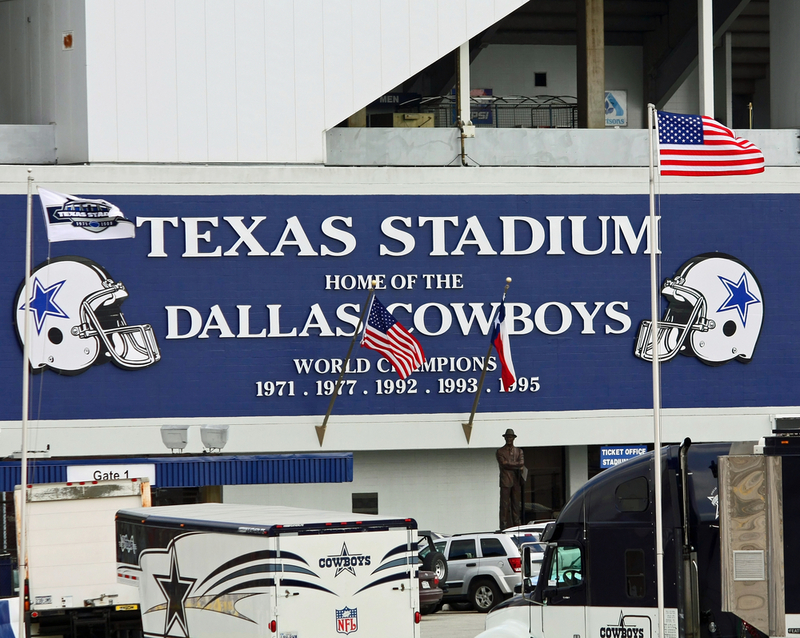 Before, the star remained exclusive to the Dallas Cowboys. But over time, it also became the logo of the AFL team of Jerry Jones, the Dallas Desperados. Between the logos and the uniforms of the Dallas Cowboys, it is the latter that has gone through a lot of changes. But let us discuss the overall look of the uniforms first. The uniform of the Dallas Cowboys come in two sets. One is used for games they play at home – this is called the home jersey and pants. The other set is used for when they are on the road – the road jersey and pants. 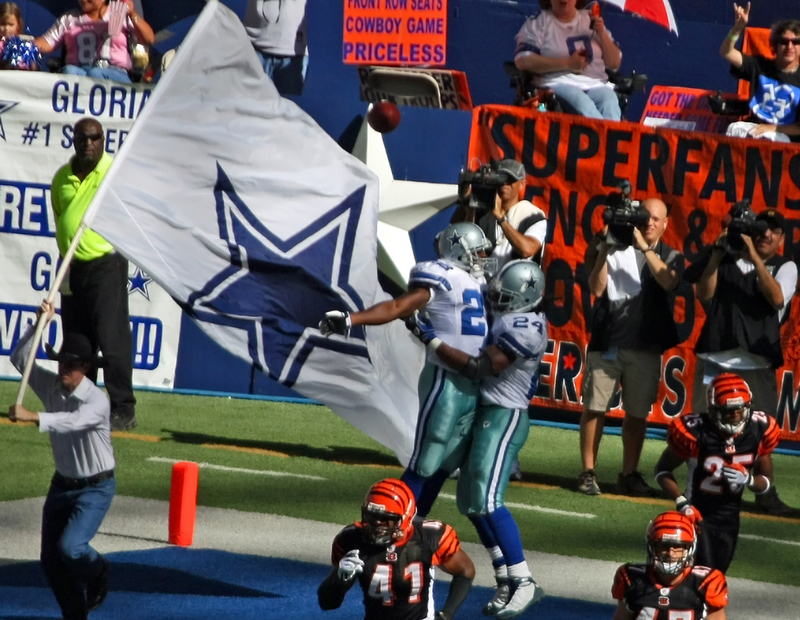 The home jersey of the Dallas Cowboys is generally white with royal blue solid socks, lettering, and numbers. It also has two stripes right on the sleeves and outlined in black. When it comes to the home pants, it comes in a metallic color of silvery-green. The road jersey is navy blue in colour. They call this the “Stars and Stripes”. It has a white lettering and numbers that has navy pinstripes. Each of the sleeves has a stripe pattern of white-gray-white. The same pattern is on the collared v-neck. On the stripes, you will see the star logo of the Dallas Cowboys. The NFL shield is on the crest and under it is the “Cowboys” chest crest. The road pants have the colour of pearl-metallic-silver. The helmet of the team comes in a unique silver colour with a tint of blue. This is known as the “Metallic Silver Blue”. It has a vertical stripe pattern of blue-white-blue running over the center of the helmet’s crown. The “Cowboys” is at the back of the helmet – right at the end of the vertical stripes. There is also a blue strip “Dymo tape” with the name of the player. It is on the white part of the stripes and embossed at the back of the helmet. 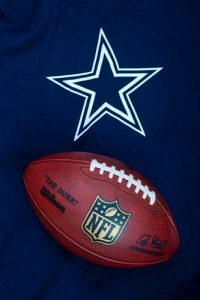 What do you think of the logos and uniforms of the Dallas Cowboys? Obviously, this design will change over the years but for now, this is how you can identify them in every game.